Your bedroom is more than just where you sleep. It’s where you unwind after a long day. It’s where you spend your lazy Sundays, curled up in bed catching up on your favorite shows. It’s where you retreat to when you need to just get away for awhile. Your bedroom is more important than you think, which is why it should be the most relaxing room in your house. Having a warm, inviting bedroom gives your space a zen feeling that could rival that of Dallas homes for sale. 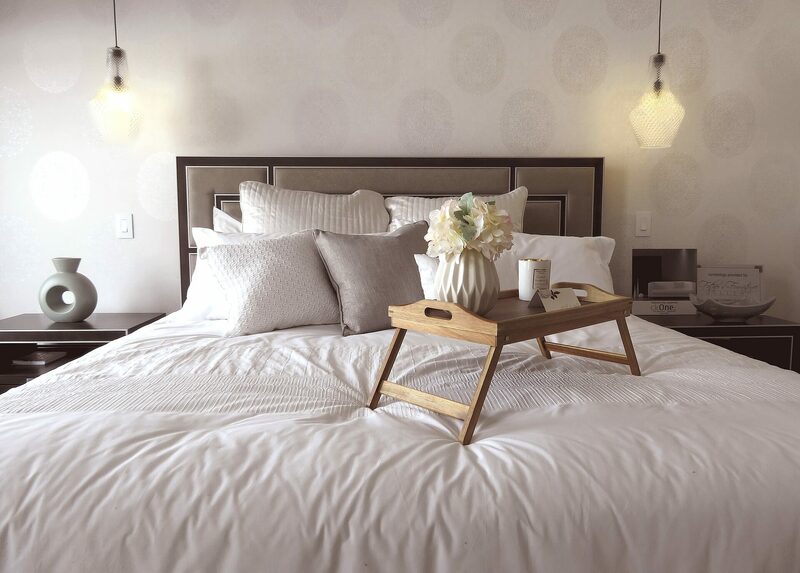 Here are a few tips for giving your bedroom a relaxing, calm vibe you’ll love coming home to. Your bed is the focal point of your bedroom, so make sure you choose bedding that’s comfortable and inviting. The first step to doing this is finding the right mattress. A good mattress means not only a good night’s sleep, but can also protect your spine in the long run. Memory foam mattresses are some of the most popular types of mattresses, as they help to distribute body weight evenly. Once you’ve chosen the right kind of mattress, assess the bedding you’ve been using. Having soft sheets that work with the season is one of the most important factors in getting a comfortable night’s sleep. For example, breathable cotton sheets are a great choice for hot summer nights, while flannel or microfleece sheets are popular winter choices. Additionally, be sure to deck out your bed with cozy blankets and pillows to make your space even more comfortable. The lighting in your bedroom can significantly affect your mood, so make sure you have the right kind of light. Natural light is the healthiest kind of light, and you’ll also be able to save money on your energy bills by utilizing the light from outside as much as possible! If you find that your is often dark, even during the day, consider purchasing curtains in a lighter color. Instead of switching on your overhead light when it gets dark out, try using a small lamp instead. This will give your room a warm glow rather than a harsh, fluorescent feel. Hanging string lights around your room is another great way to add some ambiance to your space, and you’ll instantly feel more relaxed. Having too much clutter around your bedroom can actually make you feel more stressed out, so make sure to carefully consider your decor and eliminate any unnecessary tchotchkes. Decorating your room with simple pieces, like photos of loved ones or a beautiful painting or tapestry, can give the space a warm and comforting feel. Plants can also be great additions to a bedroom, as they can improve the air and provide a calming effect. Himalayan salt lamps are popular room decor pieces, and these glowing pink lamps have several benefits as well. Himalayan salt lamps are believed to increase blood flow, improve sleep, and even help treat asthma symptoms. Additionally, Himalayan salt lamps can be used as nightlights, and the warm glow will make you feel relaxed before drifting off to sleep.